GRP feeder pillars and cabinets with IP54 and IP55 waterproof rating are available to suit customer specifications. GRP housings provide quality, durable and corrosion resistant protection for low voltage electrical distribution, 415v to 1000 volts. GRP feeder pillars and cabinets are approved to The Loss Prevention Certification Board (LPCB) - the leading international Certification Body in the fields of security and fire protection. Feeder pillars and cabinets are available with brick effect and natural stone finish. Standard Roadside GRP feeder pillars have an open base with an integral flange. Integral composite floors are available (standard on Type P, Torbette and Meter Cabinet). Cabinet fixing is through reinforced internal flanges and rawbolts on to concrete bases - GRP cabinets can be wall mounted. 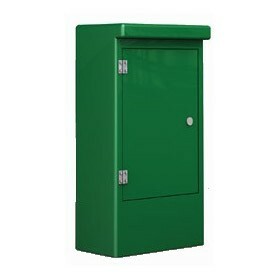 GRP Roadside cabinets can be supplied with optional extras : Internal Mounting Board, Wired Glass Window, Clamp Latches, Cable Entry Flap, Ventilators, Lighting, Heating and Cable Gland Plates. GRP Single Door Feeder Pillars and Cabinets - single door cabinets are suited to house electrical instrumentation and control panels. Typical applications include electrical equipment protection, standpipe cabinets, telemetry cabinets and sampling kiosks. GRP Double Door Feeder Pillars and Cabinets - double door cabinets are specified throughout the utilities (electricity, water and gas) industries. 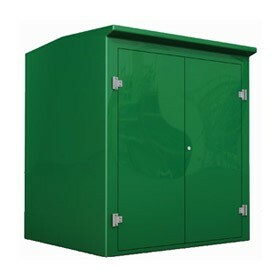 All GRP cabinets are supplied with tower bolts and the four larger cabinets feature doorstays. Typical applications include air quality monitoring at pumping stations and MCC protection. GRP feeder pillars and cabinets for specified according to WIMES for water industry LV electricity distribution at sewage and waste water treatment plants - approved by Thames Water, Scottish Water and Anglian Water.